A range-restricted Maputaland Centre of Endemism near-endemic (EOO 11 843km²; AOO <2000 km²), recorded from nine locations. In South Africa is declining rapidly in Sand Forest outside protected areas, but it is also threatened by habitat degradation within protected areas. This species also occurs in Mozambique, however the Mozambican portion of the population is declining at a rapid rate due to habitat destruction for charcoal production, the national assessment is therefore not adjusted following IUCN regional assessment procedures (IUCN 2003). 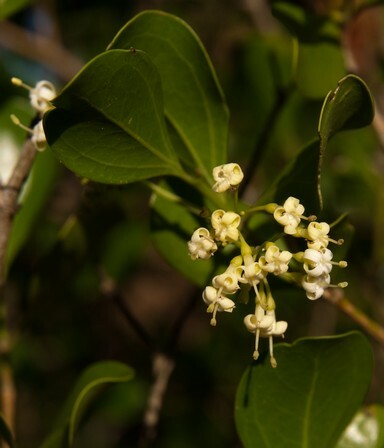 Psydrax fragrantissima is known to occur on the Maputaland Coastal Plain from Lake Sibaya in KwaZulu-Natal to Maracuene in Maputo Province in southern Mozambique. There is also an isolated inland record from the north eastern corner of the Kruger National Park on the border with Mozambique. The species is mainly concentrated in Sand Forest and thicket vegetation, occurring on nutrient-poor sandy soils at low elevations. Occasionally the species has been found in woodland (Coates Palgrave 2002). Psydrax fragrantissima is among the characteristic species of Sand Forest in northern KwaZulu-Natal (Kirkwood and Midgley, 1999) and Licuati Thicket vegetation in southern Mozambique, both of these vegetation types are on well drained soils of ancient dune formation that occur inland within 100 kilometres of the coastline. While this species is concentrated on the Maputaland Coastal Plain, it has also been recorded on well-drained sandy soils in the northern Kruger National Park, about 400 kilometres inland. This outlier record is a recent collection (2014) and the identification has been confirmed by Rubiaceae expert J. Burrows. Psydrax fragrantissima has a shallow root system suggesting it is adapted to cope with limited moisture availability and poor nutrient soils environments. This adaptation results in a slow growing life form. The majority of subpopulations of Psydrax fragrantissima in South Africa occur within protected areas such as the Tembe Elephant Reserve and Kruger National Park. However, there is concern about woodland and forest destruction and degradation due to the overstocking of game, particularly elephants, and which may also be having an impact on the recruitment of this species. In addition, Sand Forest outside Tembe is rapidly being lost to rural development. In Mozambique, this species is concentrated within the Licuati Forest Reserve, where there is ongoing degradation of Licuati Thicket vegetation due to unsustainable exploitation (Izidine et al. 2008) of forestry resources predominantly for charcoal production. During 2015 large areas of the Licuati Thicket were observed to have burnt. The slow growing nature of the species (generation length at least 50 years) suggests that fire and cutting for charcoal will result in severe declines as a result of habitat degradation and possibly an ecological shift into grassy savannas found in previously disturbed farmed areas around Licuati. Over the past five years Licuati Thicket has become one of the nearest sources to Maputo of woody trees and shrubs for charcoal. With 80% of Mozambique's population depending on charcoal as a source of energy, and all wood to make charcoal are coming from indigenous vegetation with little indication of this trend changing (Chavana, 2014). Further loss and severe degradation of at least 80% of the Licuati thicket is expected to occur within the next 50 years. There are two subpopulations in KwaZulu-Natal at Mbazwana District and in and around Tembe Elephant Park, and a third in Kruger National Park in South Africa. In Mozambique there are two subpopulations, one at Licuati Forest Reserve and the other in Marracuene District. The population size is not known, but field surveys during 2015 indicated that this species is typical of Licuati Thicket vegetation and can be relatively common in the correct habitat. Kirkwood and Midgley (1999) also note that this taxon is characteristic of Sand Forest in KwaZulu-Natal. The recent observation of this species in a small patch of sand forest that is floristically allied to the Maputaland Sand Forest suggests that this species could be more widespread on sandy formations inland. Subpopulations in protected areas in South Africa are not suspected to be in rapid decline, however in Mozambique, and areas outside protected areas in South Africa, there is rapid, ongoing population decline - the global population of this species is expected to decline by 20-30% within the next 50 years, should current rates of habitat loss and degradation continue. Bridson, D.M. 1985. The reinstatement of Psydrax (Rubiaceae, subfam. Cinchonoideae tribe Vanguerieae) and a revision of the African species. Kew Bulletin 40(4):687-725. Bridson, D.M. 1998. Rubiaceae. In: G.V. Pope (ed). Flora Zambesiaca 5 (Part 2):211-369. Royal Botanic Gardens, Kew. Chavana, R. 2014. Estudo da cadeia de valor de carvão vegetal no sul de Moçambique (Study of the charcoal value chain in southern Mozambique). Relatório Preliminar de Pesquisa No. 10P. Instituto de Investigação Agrária de Moçambique. Coates Palgrave, M. 2002. Keith Coates Palgrave Trees of southern Africa. 3rd Edition. Struik, Cape Town. Izidine, S.A., Siebert, S.J., van Wyk, A.E. and Zobolo, A.M. 2008. Taboo and political authority in conservation policy: A case study of the Licuáti Forest in Maputaland, Mozambique. Journal for the Study of Religion, Nature & Culture 2(3):373-390.